Why book with London Rent a Car? 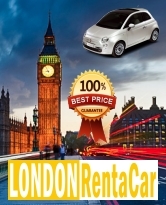 London Rent a Car is an innovative vehicle rental company in London offering cheap cars. At London Rent a Car we guarantee our vehicles at a cheap and transparent price, where is no small print and everything is clear. We never cancel a confirmed reservation! Our special service is the delivery of the reserved car at the airport of London, without waiting period and delay, just a signature and the handing over of the car key through our staff. Knowing your flight number they will wait for you personally on your arrival. Naturally you can leave the car at the airport the day of your departure. Anyway we can also deliver you the car to your residence, hotel, etc. around the city.